You’re excited to go house hunting and want to find the “perfect” home, right?! 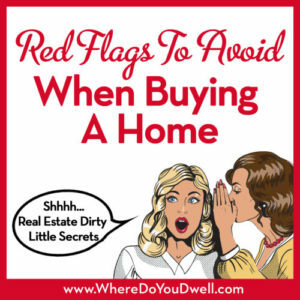 Don’t let your excitement or desire for a home spur you to make any rash decisions or overlook some serious red flags. You don’t want a home you’ll regret buying, so carefully weigh the pros and cons before making an offer. Some homes might seem good at first sight, but our list of hidden red flags could save you in the long run. At least consider them before you decide to make an offer on a home. Many “For Sale” signs, rentals, and foreclosures could mean it’s not a stable neighborhood and owners want to get out if they can. Foreclosures and rentals could mean you’ll see less maintained and more unkempt property, which can drag down values. If it’s a transitional-type neighborhood, make sure it’s an up and coming one and not declining. Sometimes it’s hard to tell by just looking so your real estate agent can go over current sales activity to give you a more complete picture. Are prices going down or up? How long are properties on the market? Are homes selling for more than the asking price? These days, many buyers want transit options and a vibrant neighborhood with restaurants and shops nearby, especially if they’re looking in more urban areas. 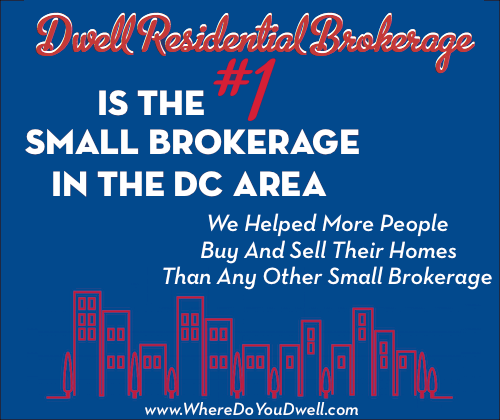 However, sometimes you can get a good deal if there is major growth coming to the area you want to buy in, even if it looks a little desolate now. This could be a great opportunity to get in before it takes off. Just make sure that any proposed plans are actually funded and approved by the necessary government agencies, and not just a developer’s pipe dream. You know you’ll need to hire a qualified home inspector to examine the home to see if there are any structural and maintenance issues. Some potential problems are hidden and hard to see at first so that’s why you want an inspector before you buy. However, you’ll need to decide if anything they find is worth the time and money to fix, or if it’s time to say good-bye. Your inspector isn’t going to tell you whether you should buy the home or not, he or she is only going to observe what is noticeable to their trained eyes on the day of your inspection. Lack of overall general maintenance. Don’t ignore this since it’s a warning sign that this home hasn’t been properly taken care of for many years. And that means that major issues – such as water damage — could be lurking. Questionable fixer-uppers. Some issues are typical for the age and location of your home and not the sign of poor construction. You may not mind a typical fixer-upper with “good bones” in certain neighborhoods, but you do want to steer clear of a home that has too many issues but isn’t really that old. That’s especially true if the construction just doesn’t seem solid or sound, and if carpentry looks unfinished. Do-it-yourself additions or any DIY work that isn’t up to code. If the addition looks awkward and cheap, it probably is and could be detrimental to the home when you want to resell. Or, you’ll need to factor in the cost and time to tear down and rebuild properly. Make sure to ask for permits pulled and approvals given by the permit or building office in the jurisdiction where the home is located. Termite infestation. This can wreak havoc on a home. Determine how bad and how much it will cost to fix and prevent in the future. You can do this for about $50 by calling a termite company. Better now than after you move in. Moisture in the basement. This can mean two things: the home’s grading has some seepage issues and you’ve got the potential for mold. Usually the basement will smell musty if this is the case. Or, you may see signs of past water damage—that brown moldy looking damage on wood. Mold is a serious issue and can cause health problems if pervasive so tread carefully! Water marks on the ceiling or walls. This could signal a leaking roof, gutters rusting, or faulty plumbing – all leading to wood rot and other possible destruction. All can be fixed but you’ll need to determine the extent of the damage. Cracks in the wall and sloping floors. Both could point to possible structural and foundation issues, which can be costly depending on the age of the home. You can get another inspection with a professional who specializes in foundation issues. Faulty and outdated wiring. This can be a serious fire hazard and you’ll have to consider the cost to fix and update. Inspectors should check for overloaded circuits and proper grounding. If you are looking to do a lot of renovations to an older home, make sure it has enough electrical amperage coming into the home. Just one freshly painted wall could be hiding mildew, mold or water damage. Too much air fresheners or scented candles could be masking a strong odor from pets, smoke, or musty mold. An oddly placed rug or piece of furniture could be hiding damaged floors or carpeting. Windows and doors not opening and shutting properly. Go around and open and close them to double check! There are pros and cons on buying new construction. The pros are pretty obvious—you’ll be the first to live there, everything is brand new, and typically features the most modern finishes on the market. The list of “pros” could go on and on! However, there are some major red flags you should be aware of when it comes with new construction, because new doesn’t always mean better. Because no one has ever lived in this home to “test” it, there could be a lot of issues that come up well after you move in. No condo building, rowhome or condo unit is perfect, just because it’s new. In fact, there could be more problems than a “used” home because the kinks haven’t been worked out yet. If no one has ever lived there, even a home inspector can’t find issues because it may take ten showers to figure out there is a crack in the pipe! If it’s a new condo building, we’ve also seen condo fees rise substantially the first year after delivery, again, because there is no history to “test” the fees. We always say, it’s best to be the second owner of a property after the previous owners have lived there for a few years and worked out all the kinks. Keep that in the back of your mind. All of these are warning signs to make you step back and thoroughly consider if you should proceed with the home no matter how much you love it. Although many things can be fixed, it really depends on your budget and the time and energy you can devote to what needs to be done. There is no right answer here, but go into buying a home with your eyes wide open. That way you’ll have a better sense of what you are getting into and you can avoid any huge surprises down the road. Next week our series will cover 4 Little Known House Hunting Tips. You’ll learn about two things you should always do, and two things you shouldn’t when looking at homes.